On a normal Friday evening, Chris and I enjoy Happy Hour with our friends and catch up on the week's activities while planning future fun. Being laid up this week, we decided it was not wise to spread the flu virus among our friends and did not attend the weekly gathering. But, we decided to enjoy a happy hour of our own. 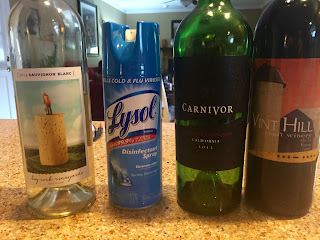 We pulled out a small selection of wines and of course, in an effort to prevent the flu from spreading to the uninfected, there was the obligatory can of Lysol. The selections included regional wines. We had some California 2013 Carnivore, rated 90, left over from earlier in the week and we included a Maryland wine from Big Cork, the 2014 Sauvignon Blanc. As a back up, we had a Virginia Merlot from Vint Hill--which remained unopened. 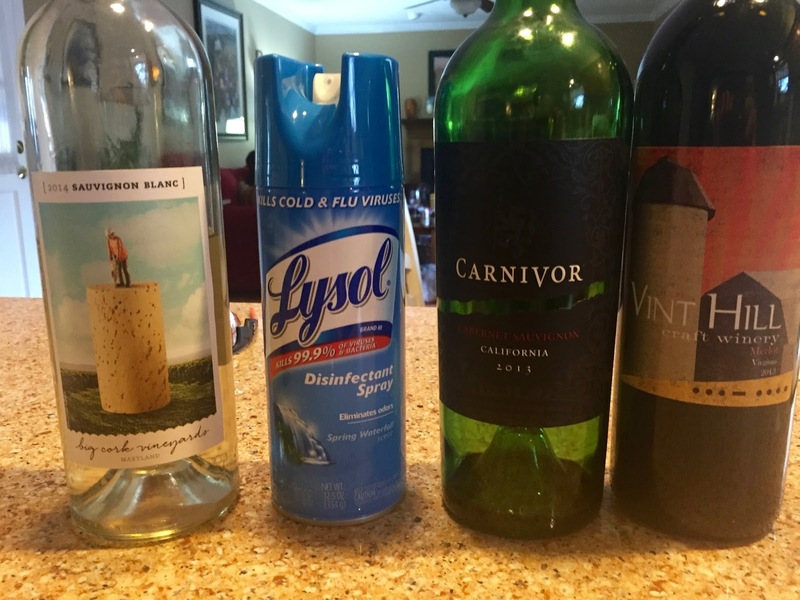 The can of Lysol was to remind us to keep the flu bug at bay and prevent reinfection or additional infections. Even though I'm under the weather does not mean I have to give up living. Chris and I had an enjoyable evening conversing and watching a movie while enjoying our wine selections.